January | 2014 | One woman. Many bicycles. Layers of deep, rich chocolate paired with caramel and cherry. Can you tell I’m looking forward to Valentine’s Day? An empire-waist peplum herringbone jacket tops a winter-weight knit dress and tights, all in deep chocolate. Soft leather gloves in caramel and boulevard heels in cherry make the outfit a special treat. In this chocolate treat the cherry’s on the bottom, not on top. Take off the jacket and an opera-length necklace and skinny red belt appear. Dark chocolate and deep cherry red were just meant to go together. 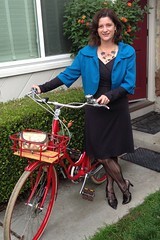 You are cordially invited to Women, Wine & Chocolate, a gathering for women who love bikes, on Sunday, February 9, 2014 at 1:30 pm at 245 S 12th Street, in the historic Naglee Park district of San Jose, California. “When will you do another ladies’ tea again?” That was the #1 question I got after our Ladies’ Tea & Bike Social last summer, both from those who attended and those who couldn’t make it. Well, it may still be too chilly for a garden tea party, but it’s the perfect time to celebrate our bike love with a little Valentine’s Day decadence. This one’s for the chocoholics, fruit and cheese lovers, and the ladies who aren’t teetotalers. 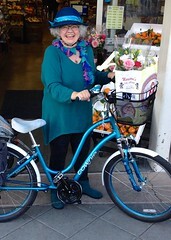 If you’re in the throes of a grand love affair with your bike and want to meet other women with that same fiery passion, pedal over to San Jose’s historic Naglee Park district on Sunday, February 9. 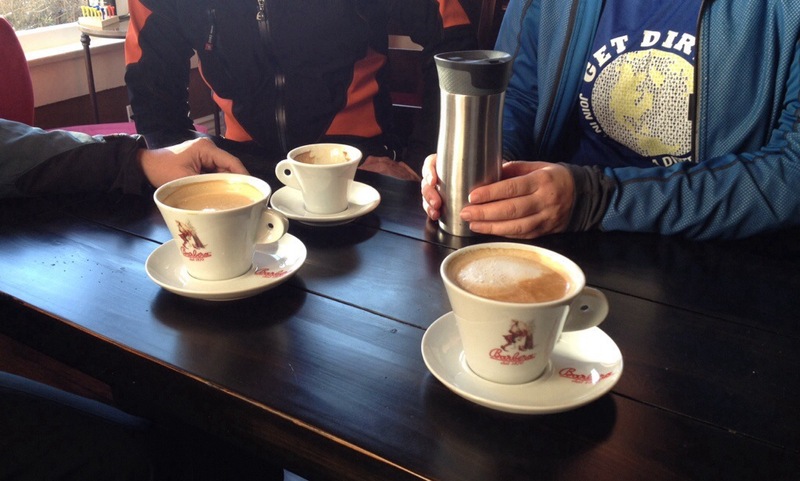 There will be wine, chocolate, cheese and fruit, plus an afternoon of stories, laughter, and tips on gear and secret bike routes. 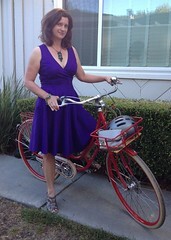 And of course, a chance to show off our two-wheeled babies. You may want to bring your bike family photos. If the weather is fine, we’ll be in Candice’ lovely garden. If not, we’ll cozy up around the fireplace and mingle in her turn-of-the-century home. So grab your favorite wine glass and something to share: chocolate, cheese or a bottle of wine or your preferred party drink. We’ll take care of the rest. 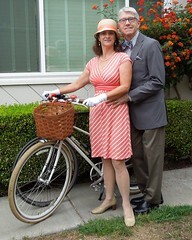 Those arriving by bike can join our pre-party ride crossing downtown San Jose on the new green lanes on San Fernando Street followed by a short tour through the historic homes of Naglee Park. Our route will be about four miles one way along lower-stress streets. Meet in front of San Jose Diridon Station at 1:00 pm. (Train arrivals: Caltrain local 12:51, baby bullet 1:03; VTA 902 NB 12:38, SB 12:59) We’ll roll shortly after the last train arrives. San Jose’s Naglee Park district is known for its grand historic homes. Homes were built in a variety of sizes and styles including Craftsman. Mediterranean style homes are more common in the “newer” sections. Our party hosts’ home on the 200 block of 12th Street was built in 1909. If you’re arriving by bike, head down the gravel driveway to the back yard. There’s plenty of parking next to the back yard’s lovely garden. When: Sunday, February 9, 2014. 1:30-4:00 pm. Note that sunset won’t be until 5:40 pm that day. Pre-Party Bike Ride: Meet at the San Jose Diridon Station at 1:00 PM for a four mile tour on lower-stress streets with no hills. A route will be posted here at least one week before the event. Parking: Bike parking will be provided in the backyard or basement in case of rain. On-street car parking is available with no weekend restrictions. Hey, Portland, can you spare us some sprinkles? 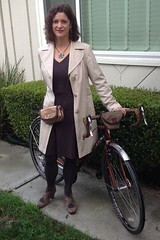 Over a month ago Deanna bought a new city bike with fenders and a new hooded raincoat, and has warm leather boots to boot. 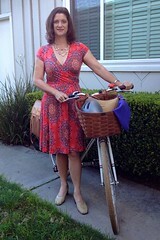 She’s all ready for an every-single-day bike commute to a new job conveniently located close to home. All she needs is a little drizzle to test it all out. 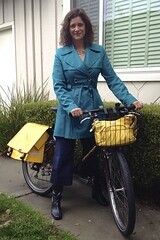 Deanna and I visited five shops before she found the city bike of her dreams, a Linus mixte in sage green. Faux lace-up boots with a wedge heels have her feet ready for a little mist. When it starts coming down she’ll zip up her jacket and pull up the hood. Until that rainy day, Deanna’s all-cotton skinny jeans will do her just fine. I missed the train today. After years of doing the “same old, same old” you think you have it all dialed in. Then something screws up your routine and you react like the grumpy curmudgeons that you roll your eyes at during City Council meetings. Change is good. This change is good. I just need to tweak my routine.